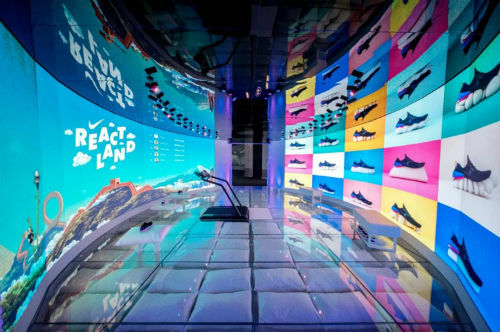 Visitors to Nike's Chinese stores can trial its new running shoes in a virtual world, Reactland, created by W+K Shanghai. Wieden+Kennedy Shanghai and Nike have taken in-store shopping to a new level with the launch of a cool interactive campaign that lets customers experience the springy technology of Nike's new React shoes by inviting them into a cushiony video game world. Visitors can try out the experience in various Nike locations in Shanghai, Beijing, Guangzhou and Chengdu via a three-minute trial. In it, they can create an avatar, slip on a pair of running shoes and hop on the treadmill. The game is displayed on a 360-degree screen to immerse the player in the virtual world of Reactland. The game itself consists of different levels populated by familiar landscapes and buildings that are reimagined as bouncy, springy cartoons. The Great Wall of China appears in the clouds, before transforming into a jungle filled with fuzzy pandas, a bubbling Mount Fuji, bouncy buildings in Santorini and Parisian rooftops – complete with jumping frogs – as well as the soft desert around the pyramids in Giza, before ending outside the Statue of Liberty. Players will receive a 10-second video of them in action, which they can then share on social media. If they run far enough through Reactland, players can even make it onto a leaderboard and track their score. “Reactland boldly challenges traditional in-store shoe trialing by combining entertainment, sharability and product education into a three-minute experience,” says W+K Shangai representatives. The experience is a fun experiment in product promotion, that deviates from the long-standing tradition of TVCs and print advertising to sell items. Perhaps the future of the industry lies in VR?